Valve’s console-like computer is now available for pre-order from Xi3, with prices starting from $899.99 (after a $100 pre-order discount). The Piston was first shown off by Xi3 during the Consumers Electronics Show earlier this year. 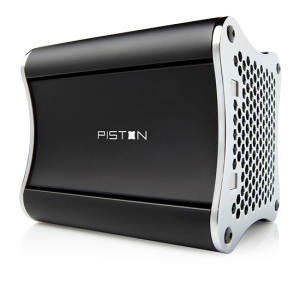 The Piston features gaming-grade hardware in an extremely small package, while maintaining upgradability. The device is still pretty mysterious, but Xi3 says that the basic model will include a 128GB SSD, 8GB of RAM, and a 3.2 Ghz Quad Core CPU. All the other hardware specifications, such as the graphics processor, have yet to be revealed. It is expected that Valve will distribute Steam Box prototypes within the next three to four months. EDIT: Xi3 has said that the Piston will ship with Windows installed, and it is not an official Steam Box.